Signed Surrealist Painting of a Young Woman from Brazil, "The Vestal"
Brazilian artist Simone Araújo paints in a surrealist style to present a fantastic composition. 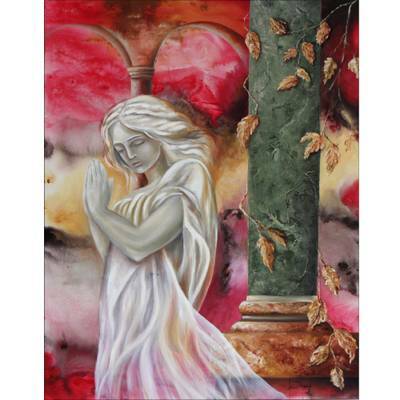 Depicted in a ghostly form, a young vestal woman stands against crimson skies with her hands held in prayer. A vestal, or virgo vestalis in ancient Latin, refers to a virgin priestess who worshiped the Roman goddess Vesta, acting as a symbol of purity for Roman culture. Titled A Vestal in Portuguese. You can find 'the Vestal' by Simone Araujo in paintings categories such as People and Portraits Paintings, Surrealist Paintings and Acrylic Paint Paintings. Enjoy exploring these sections for other Novica treasures.